Are you an existing ICICI customer & planning to invest in a PPF account? Well, ICICI is offering some perks to its users if you open a PPF account with them. Open an account & get a Rs 250 voucher of Amazon or BMS or Flipkart. How to Open a PPF account & get Amazon or BMS voucher worth Rs 250? 1. Go to ICICI Offer Page >> Apply now. Zomato Gold Membership expiring soon? We have an offer for you if you are an ICICI customer. With ICICI debit/credit card, you can get flat 20% off on Zomato Gold Membership fee. Offer is valid on 12 – month subscription plan across all ICICI cards. So, get it now. 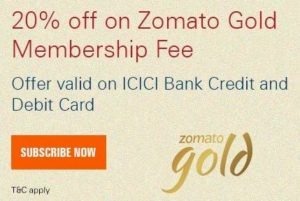 How to get flat 20% off on Zomato Gold Membership fee? Amazon Grand Indian Sale is right around the corner and we are desperately waiting for it to bring you the best offers from the sale. Meanwhile, we have an offer for you that might come handy in the sale. If you are an ICICI user, get flat 5% off on Amazon Gift Cards via ICICI Net Banking. How to Get flat 5% off on Amazon Gift Cards via ICICI Net Banking? 1. First of all, Go to ICICI Offer Page.